A compact home’s rhythmic facade and daylight-drenched interiors create a connection to nature. Nestled in a forest, the residence consists of three volumes. The patio, enhanced by a German-made beer garden table, is an extension of the living room floor, creating an indoor-outdoor living space. “It’s one way a small space can be made to feel larger,” says architect Jason W. Hart. All of the exterior doors are painted marigold, providing a friendly pop of color. The horizontal orientation of the cement board, painted black, creates a line of vision that leads to the forest, while its deep overhangs help shield the sun. A small lawn, gravel, and native grass weave the wooded setting in the residence’s landscape design. A tall gray wall, made of acid-washed zinc metal, marks the entryway and visually grounds the roof planes. It also separates the living and bedroom volumes. The Aiyyers’ midcentury furniture collection adds personality and color to the open-plan interior. A sofa by Kofod-Larsen for Selig, chairs by Viko Baumritter, shelving by Regner Christensen, and a coffee table by a local craftsmen accentuate the living room, while a dining table and chairs by Calligaris, custom cabinetry with pulls by Mockett, and an overhead Bel Occhio light from Pablo Designs complete the kitchen. Leigh’s harp, from Lyon & Healy, sits nearby. Floor-to-ceiling windows, complemented by a wood-burning stove from Jøtul, bring the outdoors in. “Movement throughout the house—down the hall, through a doorway, or across a room—is always toward a view of the outdoors, creating a connection between the inside and outside,” Hart says. Made of stained beech wood with pulls by Mockett, the bathroom vanity was custom-designed by the architects. A Caesarstone counter, Toto sink fixture, Tech Lighting mirror, and Kohler toilet and sink are surrounded by Mosa tiles. 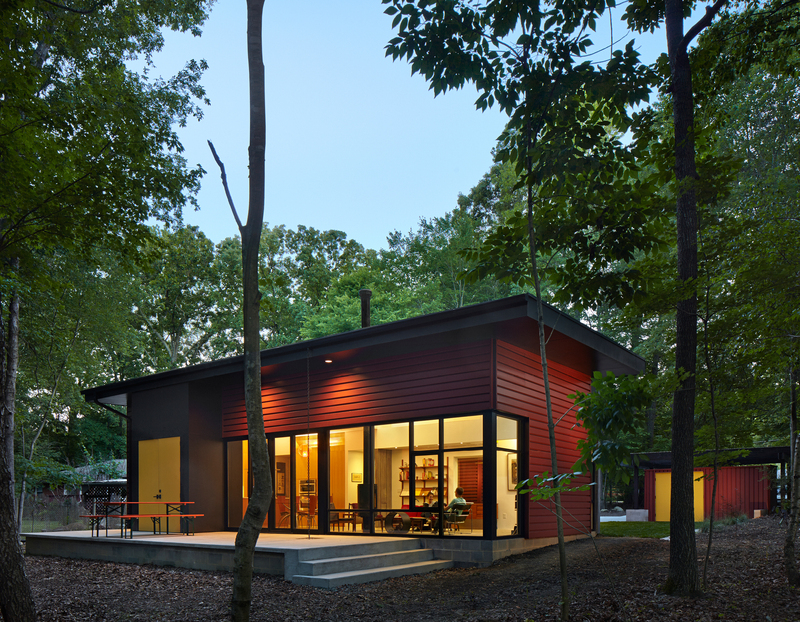 After buying property in Carrboro, North Carolina, Anantha and Leigh Aiyyer approached CUBE design + research to create a home that reflected their passions. Anantha, a professor who studies hurricanes, and his wife Leigh, a harpist, share a love of music and nature. “We carefully wove the building site into the forest,” says architect Jason W. Hart. “The result is a small home that lives big.” The single-level, 1,750-square-foot residence comprises three rectangular volumes positioned around a central entry axis. Its exterior fuses red, ribbed Galvalume metal and acid-washed zinc that evoke the surrounding trees. Wood cabinetry warms the open-plan interior, which is filled with the Aiyyers’ splendid midcentury furniture collection. Sustainable elements like geothermal heating and cooling systems keep water and energy needs low. Strategically placed windows provide natural light in every room, eliminating the need for artificial lights during the day. In the bedroom, skylights outfitted with operable blackout shades invite the couple watch the sky for hours on end.